With many years of expertise in dealing with fire and flood restoration, MMS know how important this experience is when you need it most during your time of crisis. It is vital that you take action quickly and call MMS as soon as possible. With the majority of fires and floods, there are often further hidden problems that might not be uncovered to begin with, which is why it is so crucial for our loss adjusters to come across this as soon as possible. This will make sure that you receive the highest level of entitlement on your insurance claim. A fire to your property or business could be one of the most unpleasant ordeals ever. Our North London fire restoration professionals are right here to help return your building back to its original condition. With our 24 hour helpline we are there to answer your worries night and day. The destruction caused to a home from a fire will normally result in smoke and water damage too. As with all fire repair work, this will be taken into account and we will work with your insurer to make sure you are given maximum entitlement on your insurance claim. Our North London water damage repair specialists would start the restoration process by determining the source of the water in order to avoid it from causing more damage. The drying process would then start with the use of the very latest drying technology such as our professional dehumidifier equipment. Once your property is totally dry we can then start the process of repairing you property back to the way it was before. Has your insurer requested you to obtain a builders estimate? 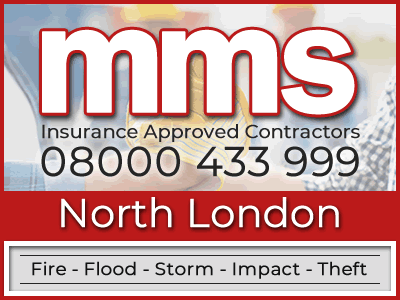 MMS aren't general builders because we solely work as an insurance approved building company that only repair homes or businesses that have been damaged by fire, flood, escape of water, impact or theft. If you require an estimate from insurance approved builders please feel free to call us on 08000 433 999. Otherwise, please feel free to contact us by leaving your details on our request a quote form.